CR17450SE-R with lead and connector but without resistor for FANUC and other controllers. Replaces: Battery Sanyo CR17450SE-R for Fanuc CNC controls such as 16i, 18i, 21i and Le Blonde 77 CNC router and other programmable logic controllers and industrial computers. This Sanyo CR17450SE-R with lead and connector but without resistor Lithium one-cell lithium battery is designed for FANUC and Le Blonde programmable logic controllers and industrial computers. 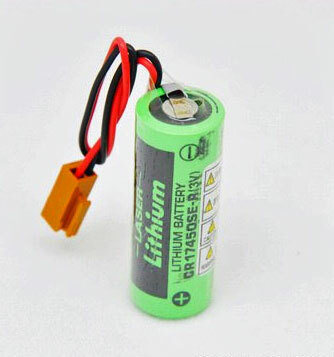 It is a DIRECT replacement for the Sanyo CR17450SE-R battery. 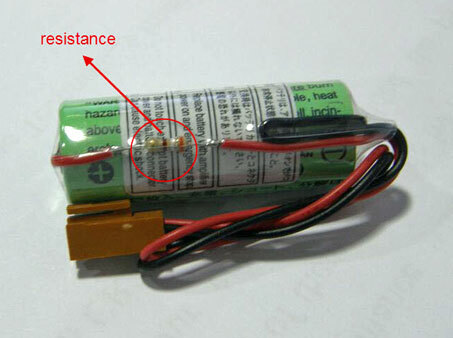 This Sanyo CR17450SE-R Lithium battery does not have a protective resistor. If your battery has a current limiting resistor, then you need our A98L-0031-0012 battery. This CR17450SE-R with lead and connector but without resistor PLC battery comes with a one year manufacturer's warranty.